I have loved books for as long as I can remember, but unfortunately I have far more books to read than time to read them. Which is why it's not often that I am able read a book a friend has recommended. I'm so thankful this time was the exception to the rule and I was able to follow through and read the book - it's one you won't want to miss! 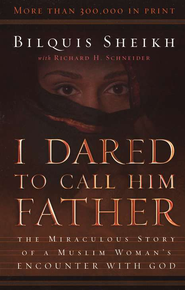 "I Dared to Call Him Father - The Miraculous Story of a Muslim Woman's Encounter with God" by Bilquis Sheikh and Richard H. Schneider. It was first published back in 1978, but still I was able to locate a copy at the local public library. This book was one of the rare few that was not only very moving and informative but also an easy read. When we're introduced to Bilquis she is a Muslim but her attitude is "God has forgotten about me and I have forgotten about God." Little does she know, the One True God is about to change all that! After being shaken by some unsettling spiritual experiences, Bilquis turned to the Quran for comfort but only found "directives for how to live and warnings about other beliefs." Having never read the Quran myself, I was surprised to learn that it contains "many references to Jewish and Christian writings that preceded it." She began to have a nagging thought that she should read the Bible and finally surreptitiously went about obtaining one. She began reading the Bible and immediately felt God speaking to her. She was puzzled because the two books were contradictory and she knew they could not both be true. God then began revealing Himself to her in dreams, so she sought out a local missionary looking for an interpretation. With guidance from the missionaries, over time she accepts Jesus as her Lord and Savior and comes to know Him in such an intimate way that she senses His presence with her and notices it is absent when she is disobedient. 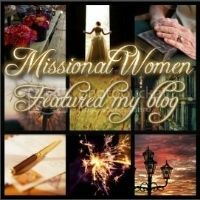 Her faith is so deep and vibrant, it made me want to cry out, "I want that!" I would encourage you to read, "I Dared to Call Him Father...," you will be blessed! This looks like another one I need to read. I think its time for a beach vacation where I can do nothing but read. This sounds like a wonderful book with a powerful message. Thank you for sharing. I'm visiting from Tell Me A Story. Older books like this one might be discovered on e-bay or some of the used books sites. The book sounds facinating and so true how a person can find God through the Bible. Dreams can be another way that God reveals himself to lost souls. Thanks for sharing with ius here at Tell me a Story. This is on my list of books to read with my daughters, a few years down the road. I continue to hear nothing but praise for it. Thank you for sharing your thoughts. 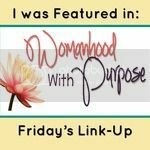 Blessed to have found you through the Growing Home link-up this morning! Neat! After being in Morocco and other locations re: Muslims, one of the main issues was that the Lord would enter their dreams and draw them to Him and give them wisdom re: how to make the adjustment. And I just desire so much to have the Lord show up more often in my dreams, too.... leading me in the right direction, always and always. Sure enjoyed this post. Thank you. Hi Lisa, I'm visiting from the 'Make my Saturday Sweet' link up. I loved this book too! I especially loved how Bilquis couldn't wait to be baptized, so she baptized herself in the bathtub! (Later being baptized by a missionary) Such a sweet and genuine lady. It was such a beautiful story of a woman finding her Heavenly Father. Sounds like a fascinating book - thanks for introducing me to a new read, Lisa! [and for linking up with #HearItUseIt this week].